I am perpetually amused by buildings whose owners fight against the building’s basic nature. When it happens to great and significant buildings, it’s a tragedy, but when it happens to ordinary and common structures, it can be a bemusing commentary on tastes and desires. 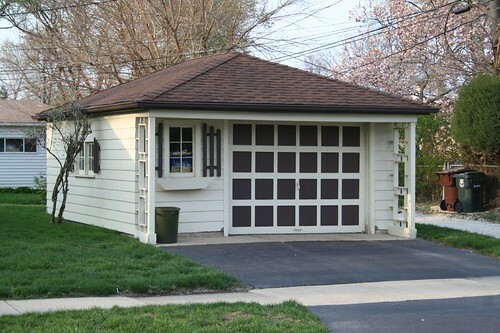 Here we have a suburban Midcentury garage rendered in wood. The car door is a grid of squares. The side screens are a grid of squares. 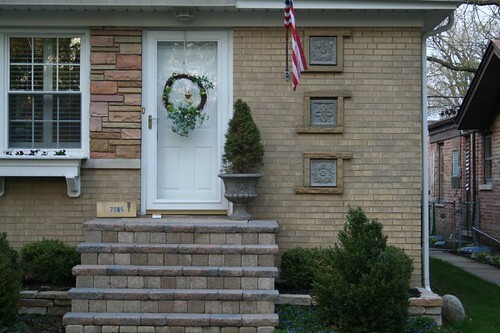 To this simple, clean composition has been appended Olde West “shutters” and a wood flower box. It apparently wasn’t enough to be living in the inner suburbs; the trappings of a frontier existence were needed. 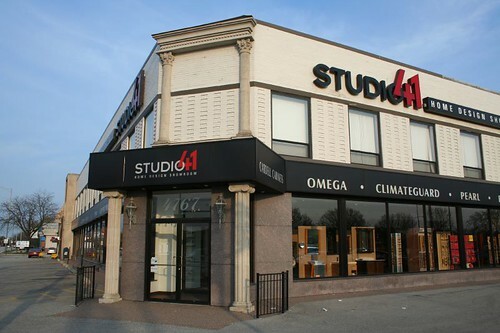 Out on Touhy at the highway, Studio 41’s interior design store apparently couldn’t be seen in a MidCentury commercial building. So, a little Greek Classical makeup was applied, apparently in the hopes that four columns and an architrave would hide the grid of recessed brick, the polished granite panels, the massive storefront windows, and the total lack of any other applied ornament. Is that a Greek Classical commercial awning I see? Perhaps a Greek Classical internally lit plastic sign, as well? Fan that I am of Chicago’s MidCentury builder vernacular, I was a bit flabbergasted by this one. Three sculptural panels have been applied over the stock triple glass block openings by the front door. They could be original, especially given how neatly they fit into the openings, but it seems to run counter to the aesthetic. What’s definitely not original is that thin little wreath, attempting to bring rustic flavor to a Modernist stew. This is a form of abuse endured by many MidCentury buildings in Chicago. The original wood doors age, get damaged, or just wear out. Rather than repair or refinish them, owners find it easier (or cheaper) to pitch them out and install a low-cost door from Home Depot. Unfortunately, those doors are made for contemporary starter castles out in the far suburbs. They look very out of place alongside the geometric details and clean lines of MidCentury Chicago. Many of the original doors aren’t terribly special — just a square or diamond opening in a flat wood door — but it damages the building’s look, and probably a few spectacular doors have been thrown out because of this trend. And then there’s this. I don’t know what it is, where it came from, or what its creators were thinking, but it’s certainly unique. It’s a suburban-scaled micro-mansion, with two-story columns flanking its miniscule entry porch, but that’s just the start of the story. It’s got floral wrought metal scrollwork, images of birds and horses and eagles, and (not pictured) a Victorian greenhouse appended to one side. 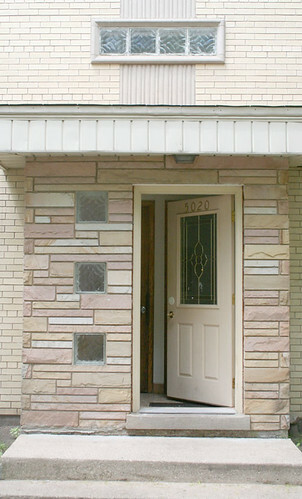 It’s got decorative brick patterns around the windows, and quoins at the corners. Quoins!! Round-topped faux-dormers break the roofline, there are flattened-arch-topped windows below, and on the far right (again not pictured) is a full-blown Palladian window. It seems to be a mish-mash grab bag of about fifty architectural ideas, all thrown in together in the fervent belief that an assembly of beautiful parts would surely result in a beautiful whole. I can’t say I agree myself, but it sure is interesting to look at! This entry was posted in Architectural Ornament and Materials, Greek statues sitting in front of 1960s apartment buildings, Mid-Century Houses, modern folk art, Ranch houses. Bookmark the permalink. ← Trilla Steel Drum Corp.
Wow, people do some crazy things to their buildings. Interesting. I know where that last photo is. It is right off of Devon and Cicero/ I’ve seen taht house a million times. i remember when tehy were building it. It took them a long time to finish. 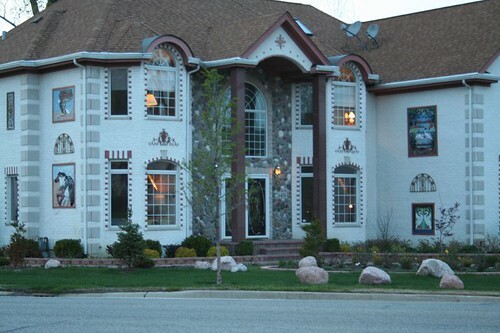 It definately much different than the other McMansions. Years ago I went trekking through that neighborhood when I was much younger and less appreciative and I remember lots of nice stately homes. I have been meaning to go back there one of these days with my camera in toe. Hello, I wonder if I could have your permission to use the image of the mid-century/Greek classical building for non-commercial purposes. I’m a planner for a small city on Washington state, and the image is perfect to illustrate design concepts (mixing design styles on a single building) for a project I’m working on to update the City’s design standards. Please contact me via email for more information; thank you for your consideration!